With increasing pressures to save energy and “go green”‚ it can be difficult to determine the appropriate and effective treatments for a historic property. From solar panels to green roofs, modern devices are increasingly popular ways to reduce the environmental impact of our existing built environment. Benefit from the experience of others. Check out success stories and learn about sustainability studies and research. also available as an interactive web feature. See how the National Park Service is responding to climate change in our national parks. 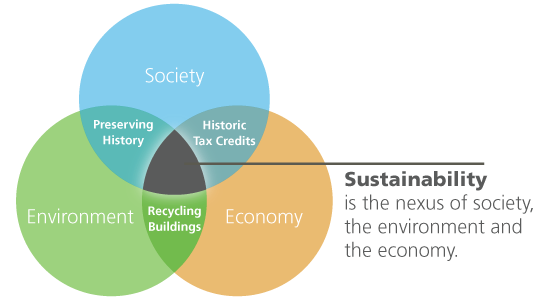 Historic preservation is inherently a sustainable practice. A commonly quoted phrase, “the greenest building is the one that’s already built,” succinctly expresses the relationship between preservation and sustainability. The repair and retrofitting of existing and historic buildings is considered by many to be the ultimate recycling project, and focusing on historic buildings has added benefits for the larger community. Traditional materials are generally durable, the continued maintenance of historic buildings and features relies on local craftsmen rather than replacement parts, and these structures generally make up the heart of our towns and cities. For decades, preservation programs like the Historic Preservation Tax Incentives have demonstrated that whole communities can be revitalized by rehabilitating individual buildings. According to the U.S. Energy Information Administration, buildings are the largest consumers of energy in the nation. In recognition of the role the built environment plays in energy use, Technical Preservation Services develops guidance and technical information about how historic properties can incorporate sustainable practices to reduce energy consumption, while maintaining those characteristics that make historic properties significant.